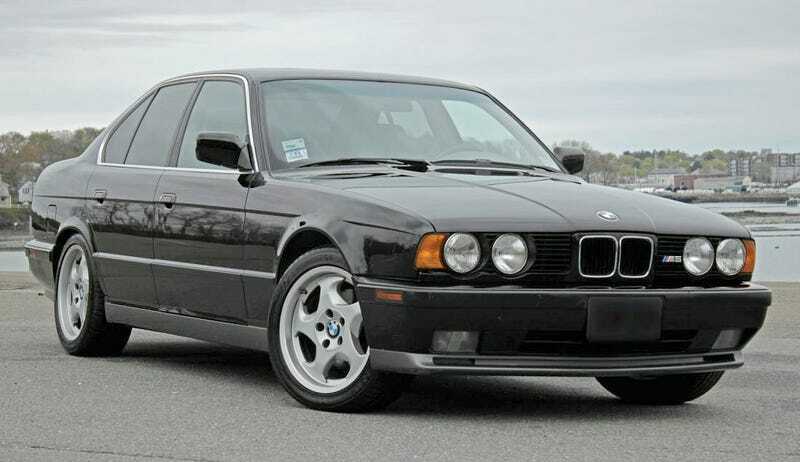 Today’s Nice Price or Crack Pipe E34 M5 represents the last edition to date to carry a six, and hence the last to trace its lineage directly back to the M1 super car. We’ll have to see if this low-mileage example’s price makes it worth climbing that family tree. Take me out to that ball game, drive me there in a RENNtech. Buy me a tuner Mer-ce-des, I don’t care if it was Ken Griffey’s… Yep, with its 52% Nice Price win, last Friday’s more orange than the Donald 2000 RENNtech Mercedes CLK 60 proved to be a home run. In fact it was a prize a lot of you wouldn’t mind finding in your Cracker Jack even without its Ken Griffey Jr provenance. You know a car that has some pretty special provenance is the BMW M5. Well, at least the first two generations. That’s because they rocked an engine that was the lineal descendent of the DOHC straight six BMW Motorsport originally dropped into the company’s remarkable M1 super cars. Later M5s have perhaps rocked more capable engines with higher cylinder counts, but it was the six-cylinder cars that made the M5 great. Here we have a 1991 E34 M5, which not only sports the 311-bhp/266 lb-ft of torque 3,453-cc S38B36 six, but which is also arguably the best looking of all M5 models in history. In fact, the entire E34 lineup was, in my opinion, the high-point of BMW Five-series aesthetic. Of course, your mileage may vary. This car also rocks some sinister ebony paint and a less menacing but tidy cream interior. M-System II ‘Throwing Star” wheels look as good today as they did back when few cars were doing uni-directionals. The interior shows modest signs of wear, especially on the parts of the driver’s seat that gets the most slide-in/slide-out action, but it’s not too bad. Other pluses here include a modest 98K on the clock and just about every piece of paper and kit that the car came with when new. The tool kit is complete (hey seller, get that allen wrench back in its slot!) and the car even comes with its original Five-series new owner cassette tape. That will be as foreign to you young-uns as a rotary dial phone or the use of full sentences, but it’s a cool and kitchy add-on for a used car. You also get substantial maintenance records and a short list of consumables that have been replaced in the past two years. The ad notes that the most recent service was completed at a BMW specialist. Work done previous to this owner is noted in the stack of paperwork too, and that apparently includes new front control arms about ten years back. Those records also reveal that this was once a Southern California car, so its current North Shore Boston location shouldn’t necessarily be a warning sign of rust or Massholiness. You could very likely find a more modern M5 to buy, one that’s faster, more capable and fancier, but why would you? There’s something about the E34 M5 that seems damn-near perfect. Let’s take a look at this one’s price and see if it’s perfection as well. The asking here is $18,900 and that gets you the car and all the records, tools, keys and cassettes to go along with it. It should be noted that there is substantial documentation online of the last time this car went on the block, and at that time it sold for substantially less. What do you think about it now? Does this low-mileage M5 seem to be worth that kind of scratch? Or, does that price disgrace this Bimmer’s heritage? Boston Craigslist, or go here if the ad disappears. H/T to FrankK986 for the hookup!